The migraine monster has been raging for almost a week now, the fairy goddaughters have come home from vacation sick as dogs, and Dragon*Con is in less than two weeks. I can do this. I know I can. I am awesome. But I’m wondering if I should just get sick now and get it over with or fight…possibly to the death? For those of you who might have missed it on Twitter or Facebook — yes, I did get a part time job working in a clothing store. I won’t mention which one (mostly since they’re not paying me to advertise on my site), so I’ll just refer to it as “Le Shoppe.” And in it, I am the Shopgirl. Tonight was my first night on the job, and we were slammed. My boss just threw me right in the deep end. Wasn’t much I could do but paddle around and ask people if they needed help I didn’t know how to give. But I asked anyway. I smiled and laughed and listened to stories and handed guests off to more experienced employees than me. I folded a LOT of clothes. I broke a sweat. I had a good time. And next time, I’ll know a little bit more. Every time will be a little less daunting. So I got home from work to a dark house — everyone was ready for bed, it seemed — but the Fairy GodDaughters trickled down the stairs while I was making some dinner to tell me about their days. Some good things, some bad things, more bad things, some cleaning, some homework, and some more cleaning (which they’re doing now…at 10:15pm). So guess which work the Fairy Goddaughters chose to go to tomorrow? That’s right, kiddies…I get TWO — count ’em, TWO — personal assistants tomorrow. BWAHAHAHAHAHAHAHA. I have a LIST. Oh, yes, do I have a list. Of things they can actually do, that I desperately need help with. And we get to do them all before I leave for the retreat on Friday! Huzzah! As a bonus — and to properly get the “Writing Lifestyle Experience” — I’ve considered inviting them to the Sherrilyn Kenyon booksigning in Arlington at 6pm tomorrow. That way they get the full effect, right? What do you guys think? Oh…goodie of all goodies!! I can’t WAIT. Hope you’re having the merriest of Christmas Days, no matter what you celebrate. 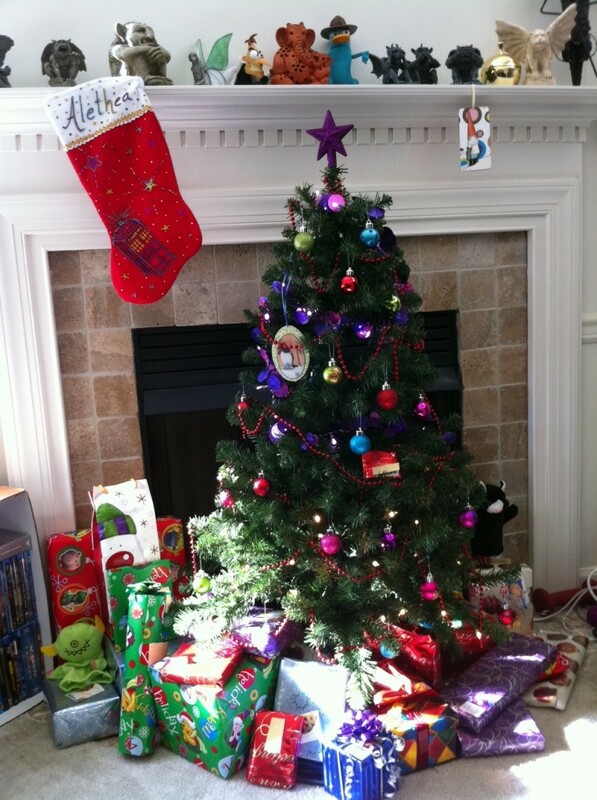 Santa was good to our little tree…we’ve even had some flurries today but nothing has stuck yet. Fingers crossed we get some white, but perhaps not as much as is predicted to dump on NY tonight. Everyone contributed to the Christmas Feast tonight — Joe’s cooking up the Christmas Steaks and portabella mushrooms with a white wine reduction. I’m taking care of the green bean casserole, mashed potatoes, crescent rolls, and gravy. The Fairy Goddaughters made shortcake from scratch, and we have strawberries in sugar just waiting to top it. Yum yum yum! I should go back to cooking and watching TV marathons with the family. What was your Festive Feast this year?